Before the Victorian Era, headstones were relatively stark. They tended to be small in size and contained only basic information, such as name, age, and date of death. If the marker was larger and had an image, this was an indication of economic means. The concept of resurrection might be depicted by winged faces, angels, and the “tree of life.” Humanity’s limited time on earth was often portrayed by an hourglass or broken column. Veiled urns are a traditional marker style that symbolizes the mourning of death. Some examples of these can be found in Forest Hill Cemetery in the southeastern corner. Monuments that have an open book are generally depicting an open Bible, which acts as a symbol of wisdom and resurrection. An example of this can be found next to the Hartley family plot in Forest Hill Cemetery. 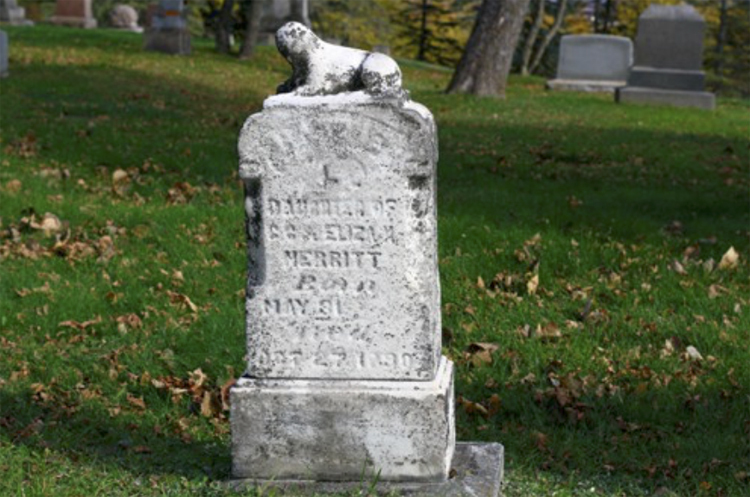 A common motif for children’s graves were carved lambs, often depicted resting atop grave markers. 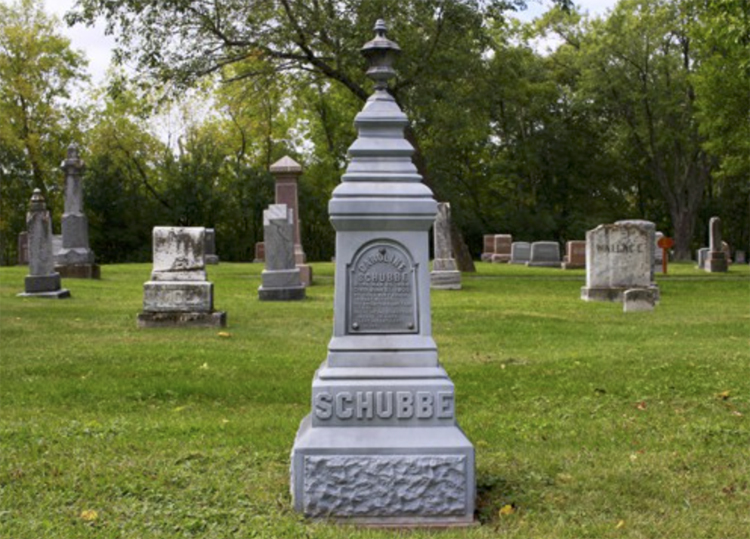 These small markers were popular in the 18th and 19th centuries, and many may be found in all three cemeteries; in particular, there is one near the Merritt family plot in Oneota Cemetery. 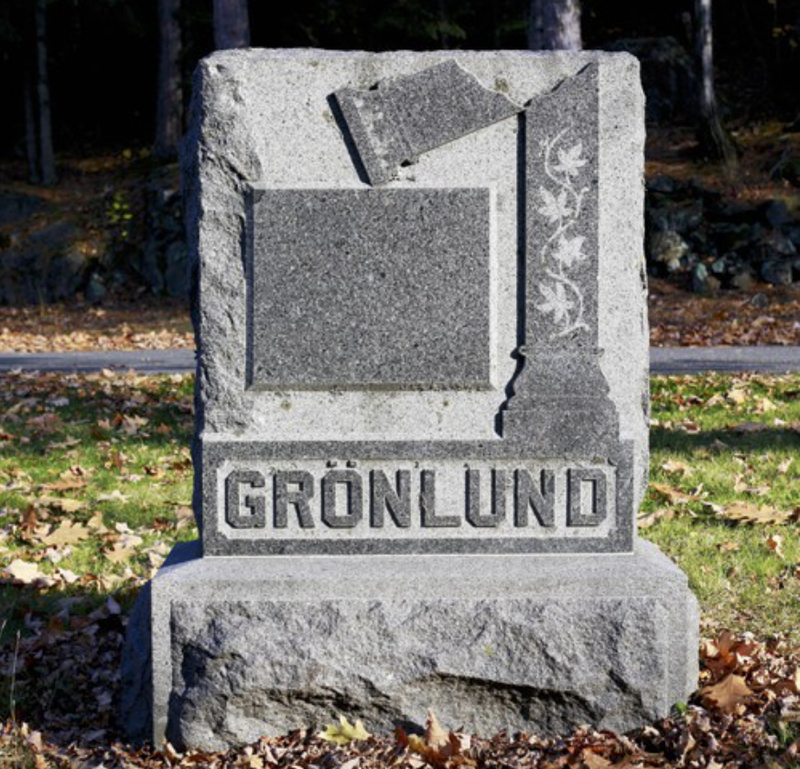 For some families, these symbols were not enough of a personalized homage to their beloved, so portraits of the deceased were engraved upon the stone. In 1854, a process was developed by which memorial creators could meld kiln-fired photos to porcelain, which could then be affixed to gravestones. These ceramic portraits became a popular means of commemorating the dead, especially in Italian, Jewish, and Eastern European communities. 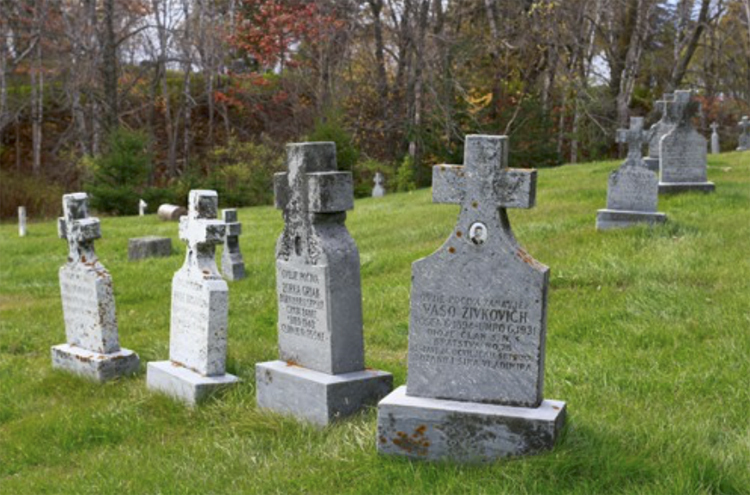 Oneota Cemetery has an enclave of Croatian immigrants with ceramic portraits in Section L.
All three cemeteries have a few examples of White Bronze monuments, which have a very distinctive history. 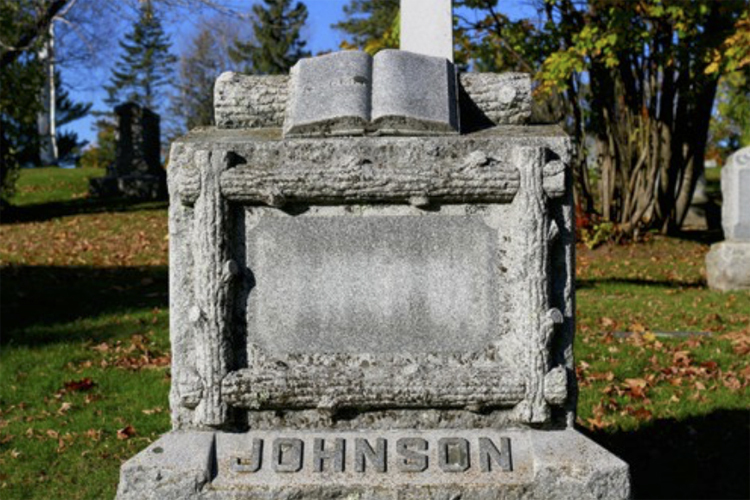 In 1868, a New York cemetery superintendent named M. A. Richardson sought an improved material for use in decorative grave markers. Mr. Richardson and his partner, C. J. Willard, settled on sand cast zinc after a tremendous amount of research. This zinc alloy was 99 percent pure zinc, with the remaining percent consisting of a copper-and-tin blend. After this business failed, the rights to this process were acquired by Connecticut-based firm Williams, Parsons and Company in 1874. It should be noted that these markers are neither bronze nor white. As a result of a process called steam-bluing—pressure steaming with linseed oil—the markers are actually bluish-grey in appearance. They are also nonmagnetic, corrosion-and tarnish-resistant, and prevent lichen from growing. Each marker is made of individually-cast zinc panels that are screwed together, leaving a void inside. Rumor has it that rumrunners during Prohibition would remove a panel from one of these markers and stash liquor inside; his customers would later retrieve the contraband. Though these monuments appear across North America, all of the panels were cast in Connecticut and later were assembled by companies in Chicago (American White Bronze Company), Des Moines (Western White Bronze Company), Detroit (The Detroit Bronze Company), Philadelphia (Philadelphia White Bronze Company), and St. Thomas, Ontario (St. Thomas White Bronze Company). The company names can be found embossed on base plates of larger monuments. Marketed as a cheap and modern alternative to stone, white bronze markers were sold by local agents equipped with illustrated catalogs. The variety of these markers was limitless, as every panel was selected and customized by the buyer. With the least expensive marker starting at $2, it was easy to sell working-class families a grand memorial for their deceased loved one. Monumental Bronze halted marker production in 1914 to assist in the war effort by producing gun mounts and ammunition. After struggling sales and World War I took their toll, the company resumed business by casting replacement plates until declaring final bankruptcy in 1939. 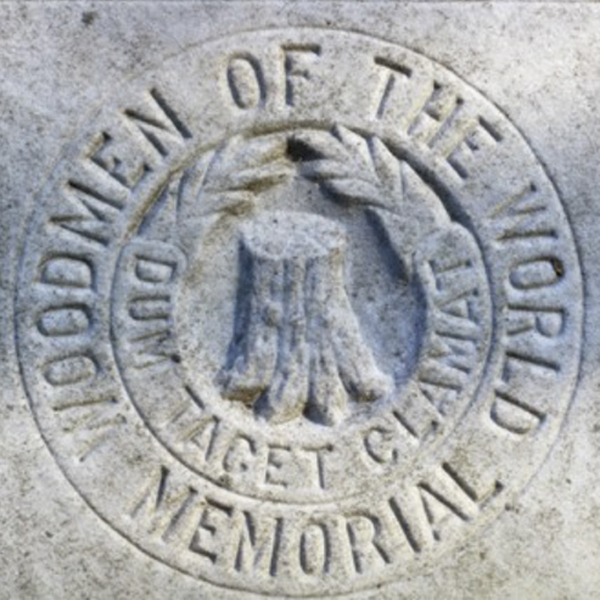 Many people who have visited Duluth’s cemeteries have noticed the distinctive monuments provided to members by the Woodmen of the World. WOW was founded in 1890 after the founder, Joseph Cullen Root, was kicked out of the Modern Woodmen of America, a group that he helped establish. Root’s focus with WOW was to help its members overcome financial hurdles. To this day, WOW offers life insurance, mutual funds, and a variety of other financial benefits to its members. One of these benefits was the provision of an iconic tree-stump grave marker, hundreds of which can be found in cemeteries throughout the Midwest. The grave markers generally associated with this program are four- to five-foot-tall carved tree trunks, a symbol of a life cut down in its prime. The dead children of Woodmen received markers made of three stacked logs. Markers were individualized with variance in stone patterns and the addition of broken branches. All of the markers were carved by local monument makers, working from patterns provided by WOW. Members who took advantage of the grave marker benefit were not required to utilize the tree trunk design—it was only required that it was displayed on the marker that they were a Woodman—but a large number did. The Woodmen were also not the originators of tree-trunk markers, as it was a design style that predated the organization. This design has fallen out of popularity among Woodmen and has since been replaced with an emblem that can be attached to most monuments. Ava Francesca Battocchio contributed to this story.